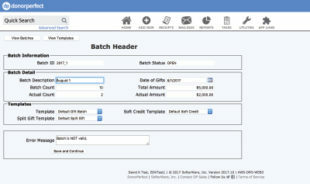 Batch Entry 2.0 is an advanced batch entry system that offers more flexibility than Batch 1.0. 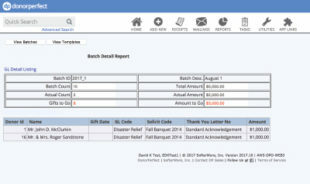 It is intended to allow you to enter gifts and pledges in batches, so as to speed up data entry, reduce data entry errors, and provide a way of reviewing batches of gifts and pledges for accuracy before they are posted to the system. 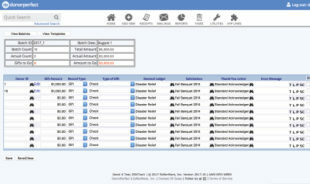 Batch Entry 2.0 makes extensive use of templates to allow you to tailor your data entry screens for efficiency. In addition, Batch Entry 2.0 line items may contain split gifts, tributes, notifications, matching gifts, applications toward pledges, and soft credits. 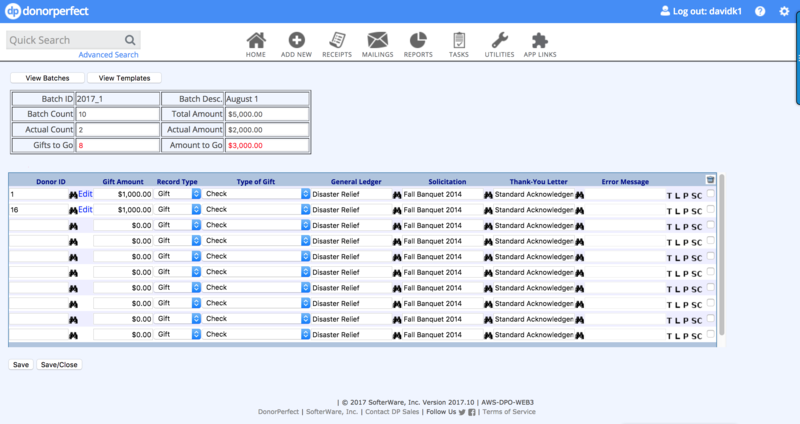 Templates allow you to store a number of settings related to a type of gift, split gift, soft credit or pledge. 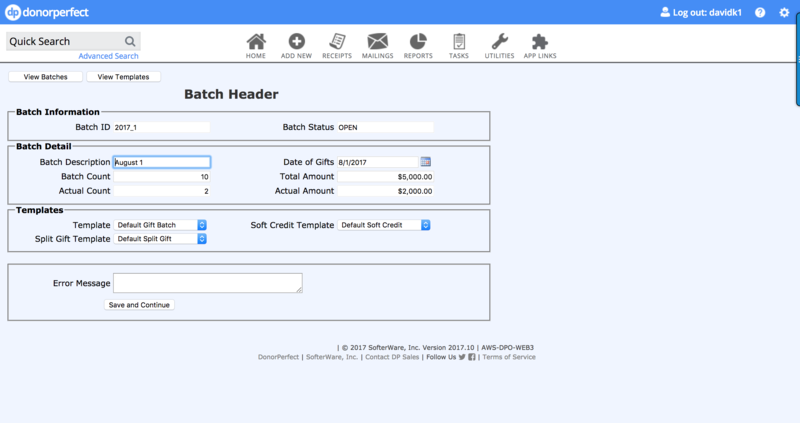 A batch is a set of donations that are entered as a group. Usually, you can think of a batch as all of the donations that make up one bank deposit. Entering the donations in a batch helps to ensure the same amount of money is posted to DonorPerfect as you deposit in the bank. Can I enter more than one batch before I post? You can enter as many batches as you want before you post. Once the posting process is started, the system will validate each batch and only allow those batches that are valid to be posted. What happens when I post a batch? 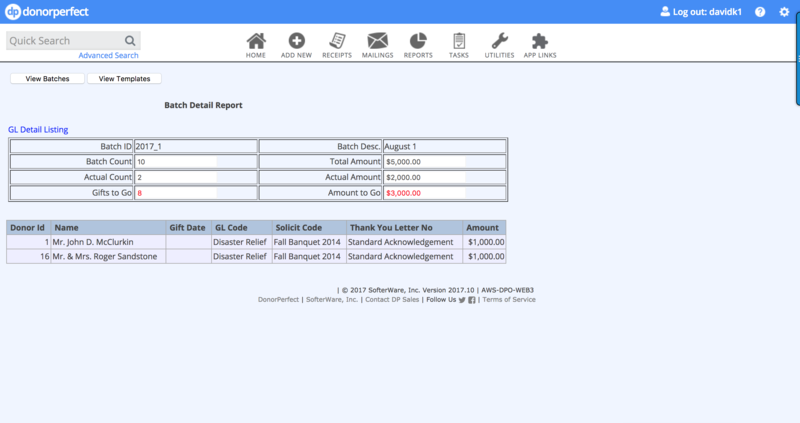 A gift or pledge entry is created for all prospects or donors in the batch. All associated financial totals are recalculated to reflect the gifts from the batch. Create templates – These allow you to enter a good amount of default information with a single selection. For instance, you can create a gift template that allows you to enter all of the gifts associated with a solicitation, and it can automatically fill in the solicitation and GL codes for each gift, with no work or chance for error. Post the batch to the System.